We usually come across a hypothetical statement “Meri bahu meri beti hai”. This is such a big statement with immense thoughts. Everyone loves to be pampered. But India is a male-dominated society, not every bahu is treated as beti.To expect this gesture you have to be immensely lucky. 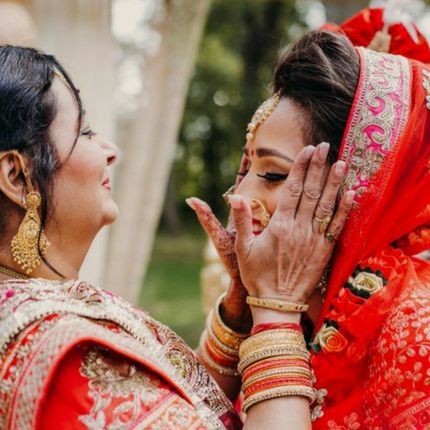 Though many people have evolved with time and stick to their words of considering daughter in law as their lifeline. While some struggle for being getting accepted. A daughter in law is always flooded with huge responsibilities and expectation. Every stride taken by her is under scrutiny. Every mother in law forgets that he too was a daughter in law. Moreover, she is still a woman and most importantly a mother. But with life long experience and in the name of traditions and rituals she forgets and neglects the feeling of a daughter in law. Every mother in law says she considers her as a daughter, then can she let her do whatever she wants to do, can she go to her own home when she feels to go, That is not the case she is barred from doing all these things, an ideal bahu is the one who seeks consent for going to her own home and moreover on the debate she comes to hear some statements like it is not her home now, she needs to consider this as her home after marriage. Now tell me how anyone can consider it as a home when she has no freedom over her thinking. A mother and a home is that spiritual place where you don’t need to say anything. Your mother understands that my daughter might be tired and your mother will serve you with the hot food were as a place which is to be considered your home, you have to get fresh and then cook for everyone. This is not true for everyone but true for many of them. Our society is dawned by a particular type of people who have these things instilled in their minds as a discipline. I think today in the world we should stop forcing ourselves, rather convincing ourselves that who care for us or not. This cannot be judgemental because it’s the behavior or approach that make us realize who really value us. It is not necessary that if your mother in law loves her son she will love you too. While if you are lucky and get that kind of pampering you are really blessed. But it is for the people around a girl who manipulate them by saying “No it is not that way she loves you its just the way of showing” Don’t try to fool anyone because it would fetch only one thing which is a tear in the eye of the girl. By fooling and manipulating her you make her do all her responsibilities and when she desperately needs the help it will be those people condemning her or not paying a heed ear. If your marriage has completed one year or silver jubilee this one topic you and your husband won’t be on same lines. How much ever hard he tries to manipulate or make you understand, girls have a power of intuition which no one can change. So girls always listen to your heart, perform all your duties and the most important thing is to be happy. You solely are responsible for your lives. Don’t give it in those hands for which you have to repent later. You are smart and confident enough to tackle situations. Take stand for yourself, fight for your rights. Though you have the most important right of keeping your family happy, it is also there reciprocated right to make you happy. So sit back and relax to deal with situations. Don’t become hasty and ignorant. You have to take care of yourself as you are not at your mummy’s place who will walk behind saying you “have food”. Though you have the best husband to care certain arguments also are left unanswered while you know what is the truth. Always works towards the happiness of everyone but not at the cost of your self-respect and happiness. If you don’t care for yourself no one will care. And a relation of the mother in law and daughter in law is no maths formula which gets derived easily with your husband words. It is a feeling which will touch your heart when weaved in the threads of love, care and trust. So always trust your intuition. Its your gut feeling which gives you solutions to dealt with all relationships. Great site, continue the good work! Way cool! Some extremely valid points! I’ll bookmark your blog and cheeck again here regularly.